Boomi is positioned to grow. Their solution addresses a pain that every single small and mid-size business struggles with; a way to connect disparate office systems and business partners on a continually supported platform. A good part of my job at the GTBP.org, over 85%, is evaluating new technologies, companies, and processes that serve the small and mid-size enterprise (SME) market. I have been rather successful at cutting through the bull, the marketing and PR spin, and sizing up opportunities. Boomi has been a company that I have been aware of for the last seven years. I have seen an evolution of sorts through the years and lately I was intrigued by the content on their website. So I went down to Philadelphia to interview Rick and get to the heart of the matter. The companies and services that I mention on the GTBP.org are companies that I am personally interested in for investing, or working with, or becoming a user of their product/services. Boomi is one of those companies that match all three of my interests. I am interested in investing, working for, and becoming a user of their "Integrate Now Atomsphere". 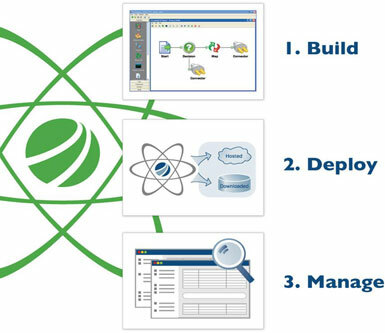 The Atomsphere tool will connect and manage software and SaaS (software as a service), on premise and in the cloud. It is a tool that a non-technical business user can visually configure and manage integration of their disparate systems and business partner connections. Atomsphere can be used for a variety of applications including: connecting processes from Salesforce.com in the cloud to Great Plains, JD Edwards, Peachtree, CA, Quickbooks, Mas90 on the company server, to SilverPoP email services, to an online store, to marketing statistics on the website, to automating custom file sharing with business partners, to custom business rules engine, to EDI software and service providers. The list goes on and on, and many of the custom connectors are now being developed by the loyal Boomi customer and partner base. The Atomsphere and the Atom are JAVA based applications which means that it will run and connect all major hardware platforms including AS/400, SUN, and NT. As soon as I met with Mr. Nucci, I began to dig right down and find out if his patent pending Atomsphere was the real deal. Is it a game changing competitive advantage? How does it bring value to the customer? And then; so what? Prove it! Most business owners have been inundated with ‘integrate all' vendors touting their XML, EAI, any-to-any mapping tools, plug and play appliances solutions for the last ten years. How is it that a small company out of Philadelphia has come up with the Holy Grail? According to Rick, the genius is in the design. Centralized Development, Decentralized Runtime. It has been patent pending now for three years and is the first to market of its kind. The Atomsphere Cloud Ecosystem is the centralized development part and the Atom is the distribution engine that can be deployed anywhere. The idea is similar to why one cannot serve web content from one data center. It has to scale from all over the world. Integration has a lot of analogies in the cloud. What does this mean for the SME business users and what new features and benefits does it offer? First, let's discuss the pain. A business has Great Plains, or JDE, or SAP on the company server. They also have Salesforce.com for the sales reps and another CRM service for customer service. And maybe they have business partners that share regular data via FTP and email. How do they synchronize and share data between platforms? Many times they have put in different tools, writing basic code, using some EAI mapping applications. But generally there are a lot of gaps that require manual intervention. Keeping updates and modifying for changes can be more than a full-time job. The APIs that one software company offer, which is the point that one integrates, many times change with an upgrade. It is common that SME offices that have done integration work lack redundancy, documentation, support resources, visibility and they have multiple points of failure. This is a real pain. Most of these companies, especially in this economy, are running on limited staff. They cannot deal with this. They are trying to sell and distribute their products. The Boomi Atomsphere product solves these issues. If you go to their website, http://boomi.com , you can start fixing the issues by downloading the full version as a 30 day trial. The solution has a user friendly visual interface that is designed for the non-technical business person. 1. The first step is to configure the integrations in the BUILD tab. Using a vizio like work-flow, you can drag and drop shapes to configure the integration for logic, validation, data cleansing and transformation from source to destination systems. Boomi Atomsphere supports 50+ branded connectors to systems like Salesforce, Netsuite, SAP, etc and 10+ traditional connectors like database, flat file, xml, web services, etc. Our connectors allow you to abstract away the code traditionally required to connect to an application, leaving you with a visual, wizard driven approach to extracting & load data. 2. Once your integration is configured based on your requirements, the second step is to DEPLOY the integration. Using the Boomi Atom technology, they support the ability to deploy integration in the cloud for SaaS, PaaS, or Cloud integration or safely behind the firewall for on-premise applications. 3. Finally, in the third step, you can centrally MANAGE all of your deployed integrations anywhere you have an internet connection. From this dashboard, you can see what processed, when it processed and the logs & status of each integration. Boomi also allows for system alert notifications that will automatically notify you via RSS or EMAIL when an integration is successful or in error. Boomi's clients don't have to worry about software upgrades and changes to APIs. These types of changes are handled and supported by Boomi as part of the service. Therefore, if Saleforce.com and Great Plains on premise both do an upgrade, changes are not a concern for the business owner. Computerworld's SaaSCon 2010 Conference was held in the beginning of April in Santa Clara, Ca. One of the presenters at the conference was Barry Newman, CIO of a mid-size company called Saveology.com. Saveology is a $120MM business with 600 employees located in four locations in three countries. They are the largest distribution partner for Comcast, Time Warner Cable, Verizon, Cox Communications, and Charter Communications. They are also a loyal Boomi customer. Mr. Newman, as the Company CIO, has a driving mantra for his company. "We are a marketing company NOT a technology company." Mr. Newman is a believer in leveraging the SaaS model as a competitive advantage. He implemented Boomi, connecting several systems and processing, in less than a month. He has a central location to manage the flow and no longer depends on expensive .NET programmers. Repeat after me: We are a marketing company NOT a technology company. Now go take your CIO out to lunch, I bet he would appreciated it (or suspect that you need something). No one thanks a CIO when everything is running well, but he gets kicked and blamed when its not.